The PRC is pleased to announce Elizabeth Cozzolino as the winner of the 2018 Parker Frisbie Graduate Student Paper Competition. This award was founded in honor of the many contributions Parker made in establishing the PRC as one the most highly-esteemed NICHD-supported population centers in the U.S. and in recognition of his contributions as a teacher and mentor. The Parker Frisbie award is an award for the best graduate student paper addressing pressing issues in demographic research and population science. The Award includes a $500 stipend. Cozzolino's ambitious paper, “Public Assistance, Relationship Context, and Jail for Child Support Debt,” examines child support enforcement as a form of poverty governance. 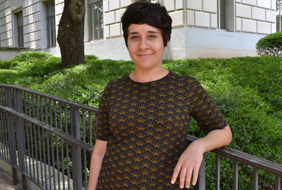 Extending work on the relationship between the welfare state and the criminal justice system, she leveraged survey data to analyze the risk of being jailed for child support nonpayment. Cozzolino found that the quality of the relationship between parents significantly predicts whether the father will go to jail for child support nonpayment, net of a host of sociodemographic factors. This paper connects micro-level relationship context and macro-level structural forces of poverty governance and has important implications for sociological and demographic research on families, the welfare state, and the criminal justice system.